The Bell Aircraft hangar at Edwards Air Force Base, Calif., in a scene from the movie Toward the Unknown. Up late the other night and looking at late night viewing options on the small screen, I saw that the movie Toward the Unknown was on offer at midnight on TCM. “What the heck,” I thought — sleep is overrated and I needed a fix of good old American aviation movie making! Toward the Unknown is a favorite of mine. It was filmed at Edwards and it’s always a great chance to test my knowledge of the locations around the base that served as backdrops to the story. My viewing experience was different this time, as I allowed myself to be drawn into the mystery of William Holden’s character. Maj. Lincoln Bond. He seemed to be a pilot with “the right stuff,” but reluctant base commander Brig. Gen. Bill Banner, played by Lloyd Nolan, kept turning him down for flight assignments. 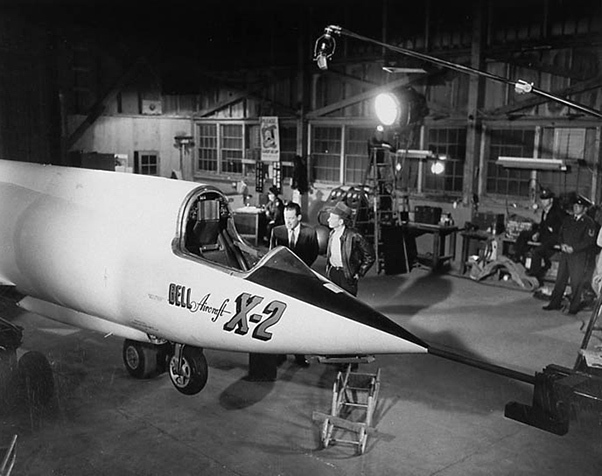 The writer who put together this story and screenplay was Beirne Lay, Jr., who was also responsible for one of the great aviation films of all time, Twelve O’Clock High. Lay always wrote in a fashion that addressed underlying personality issues when it came to military themes and the problems faced by men and women in uniform. Two of his other works, Strategic Air Command and Above and Beyond, were great works of cinematic art with great subject manner, focusing on serious issues facing the leadership of the military and the resulting stress put on the rank and file. A fun bit of trivia is that in pre-production, Toward the Unknown was going to have Clark Gable as Banner and Gregory Peck as Bond. Wrangling over the stars contracts got in the way, as so often happened back in the day. William Holden, who was trying his hand at producing with Toward the Unknown, ended up stepping in as leading man. Lay, Holden and Lloyd Nolan all had a passion for sharing stories with aviation and wartime themes. In Toward the Unknown, they were attempting to address a real-life problem that returning soldiers and airmen were facing when coming home from combat duty. 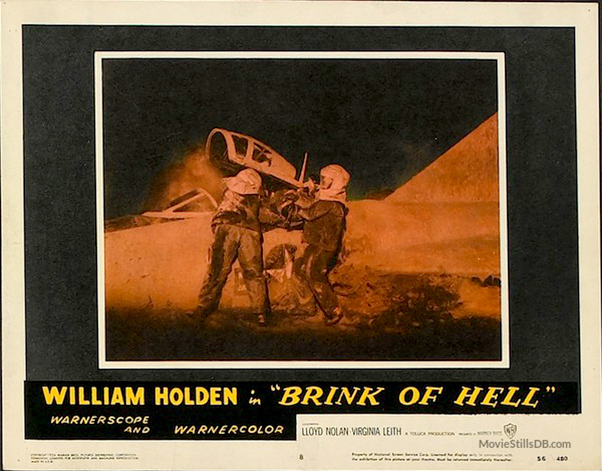 William Holden’s character Linc Bond was based on two real-life pilots who, during the Korean War, were shot down, captured and brutally incarcerated and tortured by their captors. Linc’s character was based on the real-life experiences of Lt. Col. Frank “Pete” Everest and Col. Walker “Bud” Mahurin. Add in the fact that the base commander was modeled after Gen. Albert Boyd, you then see the movie plot’s focus on the questions of how the military dealt with men who were broken down in prison, leaving them in a questionable mental state, and how can the military still find a home for them, using their years of aviation experience to further the mission. 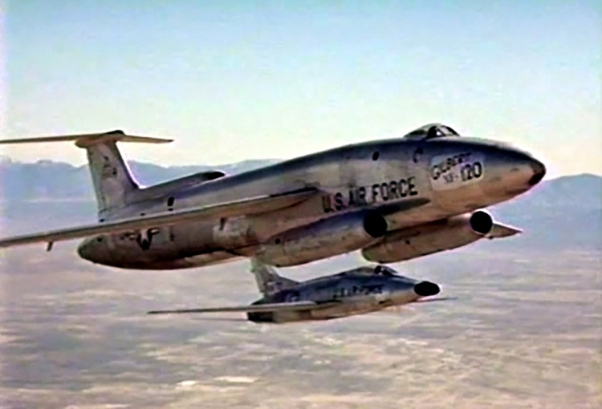 The Martin XB-51 as the Gilbert XF-120 fighter with an F-100 chase plane in a scene from the movie Toward the Unknown. It’s always entertaining to see that in a two hour-movie, Hollywood can address these issues and seal them up nice and neat — as illustrated in this movie, which features a fancy ending punctuated with the Air Force Thunderbirds at an Edwards AFB open house. 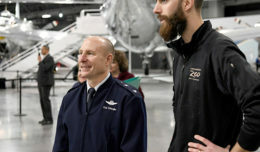 But the reality of what the production team was trying to address was not just about the unknown areas of flight research, but also the unknown workings of the human mind. Here we are, more than 60 years after the film’s release, and I’m sure many are still wondering how to deal with such delicate subjects as these even today, as we work to integrate combat veterans back into stateside military life and society as a whole. Toward the Unknown started production with a different working title and, in fact, it was the name by which UK audiences knew the film as Brink of Hell. That title was an attempt to define Bond’s character and his mental state. 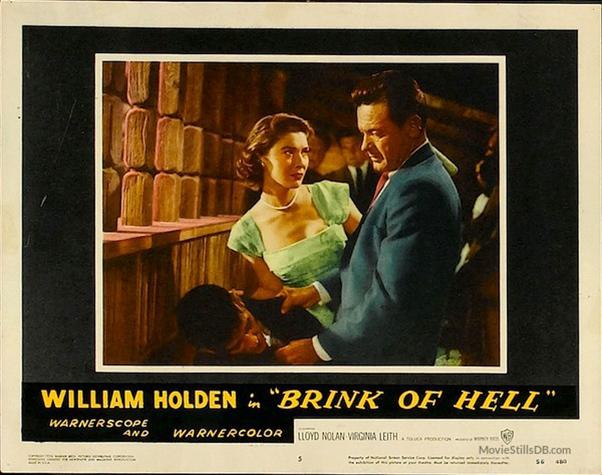 However, producer William Holden felt that a different title, that also tied into the technical aspect of flight test, would draw a U.S. audience who, during the time of the Cold War, were looking for clues to American military projects. Sure, we know that movies are for entertainment, and we also know that today a trip to the theater can also be a lecture on worldly things, but back in the 1950s, those messages were sharing the screen with some pretty cool aircraft in amazing locations! 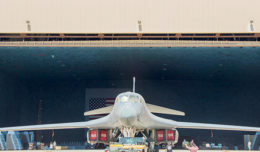 We romantics who embrace those golden years of flight test at Edwards will see the different types of aircraft, rattle off designations numbers, pick out airframe modifications in this film and be content with a two-hour history lesson live on the screen. Heck, when this film was made in the winter of 1955, I was less than a year old, but my Dad was out there working at Douglas. As a youngster, I could ID B-66s, D-588s and the Stiletto and felt the warm glow of knowing my Dad was on those projects! And even back then, a serious movie always had room for a character like Lt. Sweeney who, in later years, seemed to me to be the Air Force’s answer to Pvt. Gomer Pyle. Warner Bros. publicity for the movie Toward the Unknown. One last bit of trivia is that the character Maj. Joe Craven was played by a then-unknown military veteran/actor who would entertain us for years to come on the big and little screen. You probably remember him best from The Great Escape or The Rockford Files, but Toward the Unknown was James Garner’s first on-screen acting job! So there you go, a different look at a classic Edwards movie that is still as enjoyable to many of us today as it was back when it was released. Edwards has so many neat story lines still to be told and we celebrate those that just happened to find their way on to the big screen for all of us to see!